I didn’t realise I’d made the mistake (way back at the start) of referring to the protective box being erected around Mackintosh’s Hill House as a ‘glass box’. I hadn’t originally meant it literally, as the initial stories clearly referred to the box as allowing ventilation, meaning that it would protect the house from further wet weather damage, while allowing the water damaged structure to dry out slowly/naturally, while remedial work was carried out. But the idea stuck, and I did reinforce it by referring to another protected house, in Argentina, which actually is in a real glass box. The project is now underway, and the much better description of a ‘chainmail box’ has been applied. I don’t think the initial stories gave that sort of detail, but it does make the plan clearer now. The first pieces of a pioneering plan to save Charles Rennie Mackintosh’s domestic masterpiece from the driving West Coast wind and rain have been put in place with work now underway on the giant chainmail ‘box’ that will protect the property from the elements. 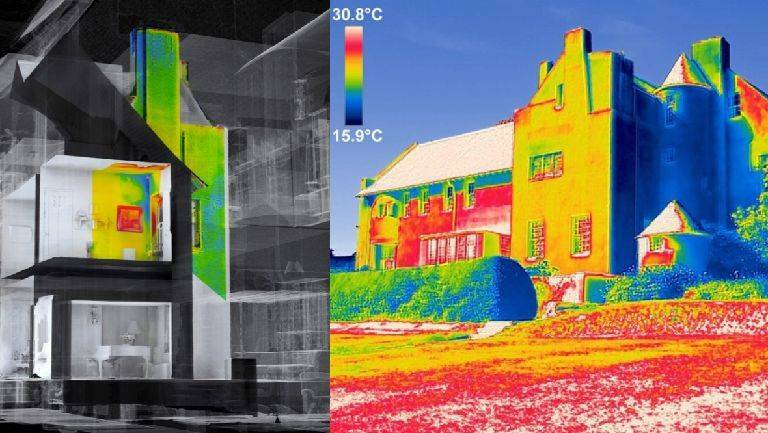 For more than 100 years, The Hill House in Helensburgh has been absorbing the worst effects of the weather putting the building and its unique interior at risk. Now, a unique chainmail structure is being built around the property which will allow conservation work to continue and the property to remain visible to the public. This semi-permeable metallic mesh pavilion, designed by architects Carmody Groarke, will allow the building to dry out over a number of years while conservation work continues. The public will be encouraged to come onto the site and see how the project is progressing, with a community hut to open over the winter. The work has been possible due to a public fundraising campaign which has generated £1.3m since February 2018. A push to find the final £200,000 required to complete the work is now underway. The total cost of the Box project is £4.5 million. As usual, The Scotsman’s ‘Comment Area’ after this story would be better described as a “Moron’s Area”. I’m beginning to miss the days when my clever adblocker used to interpret the comment service used as ‘dangerous’ and blocked it. Maybe it should have a setting for ‘useless’, and I should let it block the comment again, on that basis. I wouldn’t normally mention anything from a source that aggressively ties to block me from viewing it because I’m using an adblocker (or tries to force me to disable or even uninstall it), so while I’ll return the favour by not identifying the source of the tale, I will tell about the cat (which I should point out only eat there, doesn’t drink). The cat was being cared for by a lady in Campbeltown, who sadly died, so the cat lost its home. A couple who had been friends with the lady tool the cat in, and brought it to their home in Helensburgh, thinking/hoping it would settle in with the incumbents. However, the cat had been used to wandering around Campbeltown, and visiting the pubs. It wasn’t long before it decided it wasn’t going to change its habits, and it left its new home. However, far from being lost, it was spotted on a pub’s security camera, they opened the door, the cat came in – and made itself at home! Long story short – a deal was done, and the move from the couple’s home to the pub became official. Sorry for the generic tuxedo cat pic (obviously I can’t go with the original) – but Brook is tuxedo lady. After I mentioned the preparation being made to start work on the protective enclosure Hill House in Helensburgh, it get TWO mentions in the news. The enclosure is not sealed, but will allow the air to circulate while protecting the building from wind and rain. In the words of one of the staff, a century of Scottish weather (and unfortunately inappropriate materials) means that the building has become wet, and is being dissolved where it stands. The enclosure will give it a chance to dry out, and be worked on to conserve it. In light of the Mackintosh Building fire, it has been pointed out that Hill House will NOT have a sprinkler system, as this could do as much damage to the fragile interior as any fire, if it was triggered. Instead, staff, monitoring, and plans made with the local fire service will be used to protect the building. Sadly, WordPress still doesn’t allow BBC video to be embedded, so you’ll have to click on the link to watch. While there is a more detailed description of plans here. The Hill House | Flickr – Photo Sharing! I have to admit I’m always a little surprised to see anyone allowed to implement an innovative solution to a problem. I’m more used to seeing lots of hand-wringing, debates, committees, and rubbishing of anything that looks like a new approach – while the subject crumbles and dies, or decays the point where there no alternative but to send in the bulldozers and flatten it. I think the last time I got a pleasant surprise was when talk of tarting up the anti-aircraft gun battery off Blantyreferme Road turned from talk to reality. I haven’t made it back since an early visit (when it was really lost in the undergrowth), and have to apologise at the moment, since Photobucket’s greed has seen most of our pic links broken, but other reports I’ve been shown from visitors look good. It’s also some time since I made my way up to Mackintosh’s Hill House (well worth the effort though), and that was so long ago the place appeared to be perfect, and I don’t recall any talk of deterioration, but having followed the development of the problems reported in recent years, there seems little surprise about the growing concerns over its condition. I’m sure there will be a group of ‘Naysayers’ and miserable traditionalists (aka ‘old dogs’) that can’t live with the idea of a protective cocoon around the house, as proposed by National Trust for Scotland (NTS), but it does seem to be a more rational solution that some sort of temporary cover that would probably get blown away umpteen times, and less offensive to the eye than a solid enclosure that hides the structure from sight. I’m even more impressed to read that visitors will be able to access galleries and platforms that allow the building to be seen from within the enclosure. The enclosure is expected to go up in 2018 and could be in place for a number of years. NTS will launch one of the biggest fundraising drives in its history early in the new year to raise money for the £4m project. Born in 1868, Mackintosh trained as an architect and went on to create much admired buildings including the Glasgow School of Art and Scotland Street School in Glasgow. The building will remain open to the public while conservationists are at work, and visitors will be able to climb stairs and gangways to gain a bird’s eye view of Mackintosh’s masterpiece and watch the restoration work as it progresses. Hill House was originally commissioned by, and built for publisher Walter Blackie, between 1902 and 1904. But, on the other hand, I don’t have the bills! While I have to confess to only ever making it to Mackintosh’s famous Hill House in Helensburgh (yet have visited the town hundreds of times), I also have to admit to failing even to notice the house across the road, Morar House, also once known as Drumadoon. More conventional than its famous neighbour, having last served as a nursing home, it has now been lying derelict for some years, but it now seems there is news of serious plans by developers All Saints Living for refurbishment and internal development of the property. Obviously, I haven’t seen inside the place (and it not nearby), but I can only guess at the horrors that may have been exercised on it in order to make it compliant with the regulations for a nursing home. There will be a lot of work needed, and that does not take account of the effects of abandonment, and any vandalism that the property may have suffered. 2013: Full Planning Permission and Listed Building Consent for extension and conversion of Morar House to form 11 flats, 1 mews with the erection of 1 dwellinghouse within the surrounding grounds are under consideration with Argyll and Bute Council ref: 12/02754/PP & 12/02755/LIB. 2016: Listed Building Consent for subdivision, part demolition and conversion to form flats with associated new build is being sought ref: 16/00449/LIB. These will be explained at a drop-in briefing session hosted by the Chamber on Wednesday February 15 as they need help to give the William Leiper mansion, originally the home of the Hogarth shipping family, a new lease of life. We are seeking local construction subcontractors and suppliers to help deliver our prestigious scheme, MORAR HOUSE, HELENSBURGH. Where: Helensburgh Parish Church Hall, Colquhoun Street G84 8UP. I don’t work in the media, so have no need to come up with a constant stream of stories to convince the editor to give me a cheque, or to keep me on rather than fire me. Headlines have recently referred to the proliferation of ‘fake news’ and the problems it causes, which is almost a ‘fake news’ story in itself, as the impression given is that it is new. I don’t think it is, and the real problem is that ethics and honesty are being subverted, and these stories are being created by people who have no concept of truth, just how many clicks (or cheques) they can bank on. They’re quite happy to spread plausible made-up lies as truths, so long as they get ‘paid’ and fly just below the line of prosecution or court by remaining anonymous, or avoiding accountability. A few days ago I noted a planning application that could see the Old College Bar in Glasgow demolished. Part of the reasoning was apparently a claim by the developer that the building had been inspected and declared unsafe, but checks with Glasgow City Council confirmed that the building was safe, and no such declaration had been made. Then I read that Mackintosh’s Hill House in Helensburgh, designed and built for publisher Walter Blackie, could be sold or leased to help solve problems with running costs and falling visitor number to National Trust for Scotland (NTS) properties. One claim was that it was to be sold for conversion into a hotel. That’s only two examples. Sadly, a dig around would soon find more. It’s a shame that both the creators of these pieces of fake news, or to be honest, lies, aren’t held to account for them and the damage they can do, and the same goes for the media that happily publishes such nonsense, clearly without any fact-checking or verification. None of them care, just so long as they can push out something that will attract clicks to their material, true or otherwise, the ad-revenue will roll in. Meanwhile, places such as Hill House (or the NTS as it tries to look after the them) had to shuffle around, cap in hand, begging for donations and funding from grants and other sources. It’s a shame that the very features that give building such as this their unique appearance are often the same ones that cause them problems decades later, as Scotland’s weather takes it toll on anything but the most traditional of techniques. Coastal areas, such as Helensburgh, can be even tougher to cater for, thanks to and even damper environment and salt air. I used to get to Bute regularly, and watched some new flats going up towards Craigmore. I’m guessing the builder was not a coastal building specialist as it was not long before the nice white rendering was running with rusty brown weeping ‘sores’, and the finish was bursting and buckling off the façade as the presumably unprotected steel fittings behind rusted and expanded. Recalling the old days of the Clyde coastal resorts, I erroneously interpreted this as a reference to decorative illuminations of some sort, and not merely street lighting. one Helensburgh resident and business owner is concerned the seafront is ‘unsafe’ due to the lack of handrails, permanent barriers, and adequate lighting. He said with summer on the way, tourists who don’t know the area may be in danger of taking a wrong step and tumbling into the sea at night. I don’t know the statistics, but I have been a regular visitor, and can’t recall stories of visitors spontaneously falling into the sea, and if it’s stormy, then wandering along the edge is acting irresponsibly. Describing the seafront as ‘unsafe’ seems rather extreme and possibly politically motivated, as there are many Scottish seafronts with considerably less lighting or barriers etc than Helensburgh, and we don’t appear to have any significant problems as a result. It will be interesting to see the result of the work mentioned in this story, as one of the nice things about spending a late evening on the esplanade at Helensburgh is the relative darkness and quiet, both things we miss if we live in or near the city. I hope that sitting on the pier (in the car park) enjoying a locally procured fish supper and watching the light on the opposite shore come on as dusk falls will not become little more than a memory. I’m also somewhat amazed that no-one attempted to blame this resident’s outburst on some mythical and non-existent Health and Safety requirement. Maybe the Advertiser has been fingered for promoting such nonsense in the past, and doesn’t want to be held up as an example of that particular type of headline-making nonsense. On the other hand, the article does go on to describe works which are being carried out to improve the appearance of the area, and remove potential tripping hazards, repair road/footpath surfaces, and install various items of street furniture – and that’s all good to hear. Pity they’re not installing some good old-fashioned illuminations (as well). I’ve been watching out for mentions of the proposed submarine museum in Helensburgh, and waiting until something positive appears that suggests it is moving forward and will materialise one day. I’ve jumped on earlier mentions of forthcoming project of a similar nature in the past, because I want information about their existence to be out there, as it might be spotted by somebody who matters, but so far, feel as if I am getting my fingers burnt, as they all seem to fizzle out. I’m not going to mention any specific past project, in case I say something wrong, as I am not privy to any special knowledge, but on the other hand, do know that one or two of these projects are still being pursued, but perhaps by different people and/or in slightly different directions. Funding to the tune of £140,000 is also expected to be released by councillors for the Scottish Submarine Trust specifically towards the development of The Submarine Museum in Helensburgh. The condition of the funding mean the cash must be split evenly and released in two instalments of £70,000 when the following milestones are achieved; proof of legal ownership of the building; and receipt of Listed Building Consent. The museum aims to tell the history of the Royal Navy’s Submarine Service will be told using new media and immersive 3D projected imagery and exhibits. A 39 tonne ‘X’ Craft – or mini submarine – will be displayed as the centrepiece to the museum, which will also house an interactive electronic memorial in Remembrance of the 5,329 submariners who have given their lives in the Royal Navy Submarine Service. The project, which aims to attract 10,000 visitors to the Burgh, is spearheaded by Visit Helensburgh. The museum will be within the hall of the former St Columba’s Church, and the company will take formal ownership of the property on March 28 of this year.